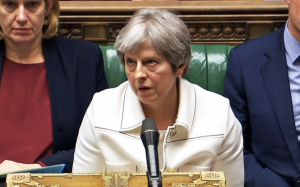 Summary: Theresa May in this photograph, taken yesterday, has the expression of a mediaeval saint about to be horribly martyred. She is responsible for the extraordinary nastiness of the hostile environments policy she developed as Home Secretary. We are now seeing it exposed with the Windrush scandal and so many other parts of what is happening with the UK immigration policies. She has consistently worked to make Conservative policy nastier and nastier whenever it comes to foreigners from outside the EU. Yet she neglected totally what she could have done easily within the current EU regulations to manage immigration from within Europe. It is difficult to exaggerate the awfulness of Theresa May’s time both in the Home Office and as PM when we think about her effect on immigration. In 2013 the Home Office (Theresa May was Home Secretary then) establish her “hostile environments policy” which was designed to put every possible impediment in the way of immigration from outside the EU. For many years apparently minor changes to Home Office rules have been made to tighten the screws on almost anyone who wants to come to work in the UK even if they have a firm job offer. Bringing in your partner or your children is made almost impossible if you are a lower earner. If you don’t have the right documentation you will be thrown out summarily. The inhumanity of one tiny aspect of that policy has been exposed by the Windrush scandal. Jamaicans who arrived in the UK at the invitation of the British government were given no papers on arrival. They worked for decades, paying their taxes and national insurance only to find themselves being summarily deprived of their jobs, medical and social care treatment and any access to benefits. In one case a man who had been in the UK for over 40 years was diagnosed with prostate cancer. He was asked for £54,000 upfront for treatment. Others have already been deported. But that is only one part of what has been so awful. In order for a non-EU citizen to come to the UK and work they need a Certificate of Sponsorship. These are issued provided the applicant has been offered a job that is well paid, at least £30,000 and for some jobs much more than that. The number of CoS’s available and granted has dropped by 60% over the last 12 months. We now have a situation where highly qualified consultants from outside the EU are being offered posts that the NHS desperately needs filled to have their CoS denied. Others critical to our economy are being turned away. And then what happens if you have a job (and many immigrants have relatively low paid jobs) and you want to be joined in the UK by your partner and children? Well, in many cases, that’s just too bad. You would have to earn nearly £25,000 per annum to bring your wife and two children. And an extra £200 per year for healthcare. And the Visa only lasts for 33 months though it can be reapplied for. After five years you can apply for permanent residency (a cost of over £1000). You also have to provide an enormous amount of documentary evidence such as having lived together, having children together (can you prove they are your children?) or having a shared bank account or savings together. Often not the case for people on low income. If you get divorced everyone is out. And don’t for a moment think that any of this will be resolved quickly. Often summary deportation documents will be issued and you can be arrested and within 72 hours put on the next plane out. Massive inefficiencies in the Home Office procedures can mean detention for years. The system is harsh and has no concept of humanity. It redefines the concept of being nasty and unthinking and uncaring. While all this was going on, Theresa May as Home Secretary did absolutely nothing to implement the standard widely agreed EU regulations covering the movement of people into the UK from within the EU. There are many limitations and restrictions that could be imposed. These regulations require a level of income, and many other restrictions that stop people living here on benefits. You can read more about that here: http://outsidethebubble.net/2018/02/26/labour-can-substantially-restrict-freedom-of-movement-under-current-arrangements/ . Brexit was a great success for the Leave campaigns who have admitted using Nazi era propaganda methods of disinformation and exaggeration. One of the key concerns of the UK electorate has been for many years in word immigration. The way these are counted to include people such as students who almost always return to their home country yet are assumed to stay on is typical of what has happened. The Brexit campaign used these concerns quite unashamedly. The notorious picture of Nigel Farage in front of poster showing a line of refugees taken far from British or indeed European borders. Using the techniques outlined by Cambridge Analytica they fed the most outrageous lies through social media to pervert a referendum in a totally undemocratic way. Their total opposition of Brexiteers to a second referendum shows everyone that they know they have been found out and they dare not allow another vote that they realise they could well lose. Gradually people are realising that the country simply cannot function without immigration no matter how much the right-wing media keep focusing on it. What happens to the 3 million EU citizens currently living in the UK after Brexit? This of course is another part of the negotiations that have not yet been finalised. It is likely that each will have to pay a fee in excess of £1000 for this application. This will only apply to anybody from the EU who are still left in the UK after Brexit!